Teplar helps to create bridge between physical and digital worlds through Internet of things. IoT-enabled devices and software touches every aspects of real world. In today’s world, sensor equipped industrial tools connecting with AI are increasing day-by-day. Latest technology in medical field has equipment’s that self-diagnoses with power of AI send analysis to their operators. Automobiles such as cars and two wheelers engage new features through mobile app connection and improve efficiency for the customer. In future refrigerators might be able to give information about the conditions of food, fruits and vegetables and microwave ovens might be able to know, how to cook it. Teplar's embedded engineering teams leverage in innovation of an embedded ecosystem involving beacons, Bluetooth, device drivers, firmware, LTE, Wi-Fi, secured storage, sensors, custom audio/video devices, routers, camera etc., to deliver the most scalable solutions in embedded systems. 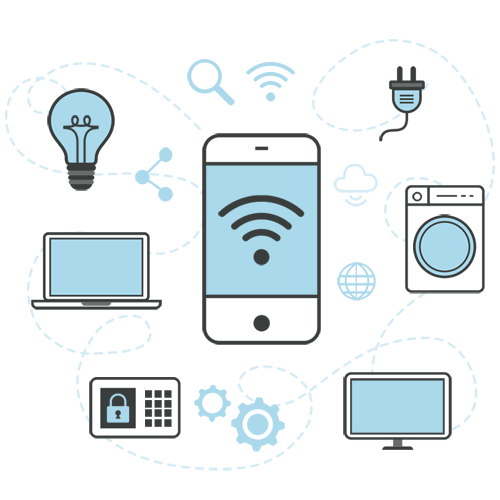 We also develop reusable components, device companion tools to build quality Internet of Things solutions with reduced time & cost. Our expert team in IoT, design and develop custom devices based on industry or business needs. We utilize right combinations of electronic components, codified logic, sensors and integration of latest technology mechanisms. Teplar develop devices with the right and interactive user experience, sensing capabilities, connectivity and robustness. We develop Web service API's for different protocols and network standard, to enable speed and lightweight networking between the internet of thing devices and the back-end systems. Few of these standards include, Web sockets, HTTP, SOAP, REST, etc., and are developed based on the user requirements. Our in-depth knowledge in API development helps to integrate third party software, device, integration patterns and the participating platforms. We enable and advance your IoT adoption journey. Examples of such integrations are CRM, OSS/BSS integration, SMS integration, Billing system integration, Ticketing system integration, etc. Combine access and knowledge to manage the entire IOT lifecycle processes. Innovative product design capability leading to positive customer experiences. Strong industry expertise across all verticals domains. Our pre-defined software frameworks and ready to run components, hardware reference prototype designs, application containers, base data models, and business flow templates to reduce time to market. Mature IOT ecosystem partnerships and engineering service knowledge across the IoT solution stack. Why TEPLAR for IoT Development? We give insights to clients for enabling them to embark on IoT journey. Facilitating business Case Preparation, Roadmap Creation, Use Case Definition, Solution Blueprinting, Domain-based Value Stream Mapping, ROI Mapping and Business KPIs. Providing end to end solutions from equipment, sensor integration, device enabled Business Intelligence Integration, by leveraging partner products and our domain expertise. We analyse vulnerability assessment, Zoning and Separation of Networks, Assessments and Audits, Sustenance Managed Services, Incident Response and Recovery Risk Assessment and Risk based Compliance. We Integrate optimized smart solutions into the existing ecosystem of the into IoT chain of Facilities Management and monitor with Smart Facilities.